Mix all ingredients. 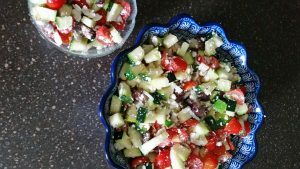 Top with Greek Salad Dressing or Zesty Italian Dressing just before serving. I took this to a cookout with the dressing on the side. I directed people to add dressing when they served themselves. This kept the salad from getting too wet while it sat.